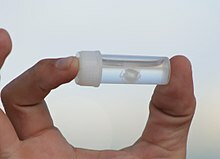 The Irukandji Jellyfish is tiny, but very venomous. Jellyfish stings in Australia can cause pain, paralysis and death for swimmers with exposed skin. Numerous venomous species of jellyfish occur in Australian waters, including the box jellyfish and Irukandji Jellyfish. Box jellyfish are believed to have caused at least 69 deaths since record keeping began in 1883. Although they are commonly mistaken for jellyfish, bluebottles are actually siphonophores. Irukandji are rarely found outside Queensland, the Northern Territory and Western Australia. Between 1985 and 1997 from cases of Irukandji sting where location was recorded, there were 83.4% in Queensland, 9.1% in the Northern Territory, and 7.5% in Western Australia; 81.5% of cases occurred in the afternoon. In a fourteen-year period there were 660 Irukandji stings in Australia, which were recorded by Dr Fenner, a medical officer with Surf Lifesaving Australia. There were 159 Irukandji stings reported in Broome in a five-year period with 25% of those stung being hospitalised but no recorded deaths. 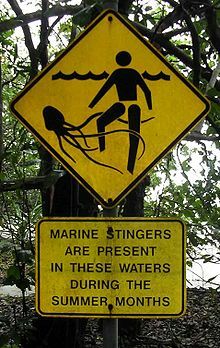 There were 62 people reported being stung by Irukandji in Cairns in 1996; of these more than half occurred in December, 92% were stung on hotter than average days, with 63% occurring while swimming inside a stinger net enclosure on the beach. In summer 2001-02 there were 160 people stung by the middle of February, with around 100 of these in Cairns, and between 10 and 20 in Townsville, the Whitsundays, Great Keppel and Agnes Waters. Northern Territory hospitals report approximately 40 jellyfish stings annually. This is a list of fatal jellyfish stings that occurred in Australian territorial waters by decade in reverse chronological order. 74 2016 November Irukandji (suspected, not confirmed) Queensland Michelmas Cay. Two French tourists died within 10 minutes of each other. Hypothesis formed by cardiologist. Dismissed as speculation by tour operator. 76 2016 November Irukandji (suspected, not confirmed) Queensland Michelmas Cay. Two French tourists died within 10 minutes of each other. Hypothesis formed by cardiologist. Dismissed as speculation by tour operator. Boy 7 2003 March Chironex fleckeri Queensland Wongaling Beach near Cairns, stung on chest and neck. Allegedly the 68th person in Australia known to have died from a chironex fleckeri sting since records began in 1883. Boy 6 1984 January box jellyfish Queensland Lockhart River, 300km north of Cooktown. Boy 5 1980 December Queensland Wongaling, near Tully. Animals were observed by victim's older brother. Woman 26 1971 November Queensland North Mission Beach. Investigated by Dr J. S. Barnes of Cairns. Gregory Noel Jarrot 12 1971 January Queensland Seaforth Beach, 40km north of Mackay. Terence Barney 5 1965 January Queensland Mornington Island, Gulf of Carpentaria. Aboriginal boy was pronounced DOA at hospital. Paul Haritos 6 1964 Chironex fleckeri Northern Territory Mica Beach, four miles from Darwin. Victim was standing in calf-deep water. Collapsed instantly and died quickly. Girl 1963-64 Chironex fleckeri Queensland Occurred "a few months earlier" than the Paul Haritos incident. Lynette Mary Starkey 11 1957 Queensland North Mission Beach, Queensland. Stung on the legs while bathing with other children in shallow water. Collapsed on the beach and died. Weals visible on her legs. Clarke William Currow 8 1954 February Northern Territory Darwin, close to Larrakeyah army barracks, three yards from shore. Died a few minutes after being stung. James Ernest Lane 33 1953 July box jellyfish (definitely not a Portuguese Man o' War) Queensland Saltwater Creek, Townsville. Victim experienced severe pain, paralysis and frothing at the mouth. Wojcik Czestaw 31 1950 Physalia utriculus, also known as Portuguese Man o' War Northern Territory Mindil Beach, Darwin. Died within minutes of being stung. Specimen was collected and identified by Frank McNeill, curator of invertebrates at the Australian Museum. Victim's name was also reported as Wokeik (rather than Wojcik). Brian Andrew McNamara 10 1949 December box jellyfish Queensland North Mission Beach near Tully. Man 1944 January sea wasp Northern Territory Victim was a serviceman. Robert Ernest Day 8 1941 Queensland Rowe's Bay, Townsville. Boy died enroute to hospital. Thomas "Tommy" Frederick Chandler 11 1938 March sea wasp Northern Territory Lameroo beach, Darwin. Government baths. Stung on chest, body and face. Jellyfish specimen was collected for analysis. Victim's name was also reported as Robert Chandler. Chandler died 15-20 minutes after being stung. A boy called Bennie Babun who went to his rescue was also stung and hospitalised. Others stung during prior fortnight were treated with morphine. David William Taylor 19 1937 box jellyfish Queensland Bramston Beach near Babinda, Cairns. Stung while in waist-deep water. Assisted from the water by George Giffin but collapsed and died thereafter. Salvatore Cantarella, male adult 1934 box jellyfish Queensland Googurra Beach, near Tully. Marks on right leg and left foot. Believed to have died of shock and heart failure after the sting. Post-mortem conducted by Dr. A. R. Townsend. Charles Trenaman 15 1916 March Portuguese Man o' War Queensland Rose Bay, near Townsville Stung on neck, body, shoulder and legs. Died about 10 minutes later from "nerve shock from pain". Albert George, boy 1911 May Queensland Cannon Valley beach, Pioneer Bay, near Mackay. Arms attached to the boy's belly, torso and arms. Victim lost consciousness and died within half an hour. Open bathing at this location was prohibited after this second death within 6 months. Gould, boy 1910-11 Queensland Occurred during Christmas holiday period. Cannon Valley beach, Pioneer Bay, near Mackay. Some jellyfish attacks which have appeared in reliable sources are listed below. 3yo girl Dec 2008 Milingimbi, girl almost died, said to be lucky to survive. 24yo Man Nov 2003 box jellyfish Sydney, NSW, man almost died, treated days later. Too numerous to list. Virtually every person living on the coast in North Queensland knows of someone who has borne the scars and debilitating pain from Box Jellyfish stings. These scars often remain for the rest of the victims life. ^ a b Government, Northern Territory (2016-05-12). "Jellyfish". nt.gov.au. Retrieved 2018-06-26. ^ a b "French tourists likely to have been stung by Irukandji jellyfish: cardiologist". ABC News. 2016-11-17. Retrieved 2018-06-26. ^ a b c "Boy dies from box jelly fish sting - theage.com.au". www.theage.com.au. Retrieved 2018-06-26. ^ a b "Toxic shock from stinger family". www.abc.net.au. 2002-10-15. Retrieved 2018-06-26. ^ "Jellyfish kills boy". Canberra Times (ACT : 1926 - 1995). 1984-02-01. p. 13. Retrieved 2018-06-26. ^ a b "Marine stinger kills boy". Canberra Times (ACT : 1926 - 1995). 1980-12-19. p. 7. Retrieved 2018-06-26. ^ "Fatal sting". Canberra Times (ACT : 1926 - 1995). 1971-11-22. p. 3. Retrieved 2018-06-26. ^ "Boy dies of jellyfish stings". Canberra Times (ACT : 1926 - 1995). 1971-01-02. p. 3. Retrieved 2018-06-26. ^ "Sting kills Aborigine". Canberra Times (ACT : 1926 - 1995). 1965-01-19. p. 17. Retrieved 2018-06-26. ^ a b "Boy Killed By Sea Wasp". Canberra Times (ACT : 1926 - 1995). 1964-02-24. p. 3. Retrieved 2018-06-26. ^ "Shock Was Cause Of Boy's Death". Daily Mercury (Mackay, Qld. : 1906 - 1954). 1949-12-21. p. 1. Retrieved 2018-06-26. ^ "Child Dies From Stings In Surf". Canberra Times (ACT : 1926 - 1995). 1957-12-14. p. 1. Retrieved 2018-06-26. ^ "Killer Sea Wasps Identified At [? ]bane Museum". Canberra Times (ACT : 1926 - 1995). 1956-12-18. p. 3. Retrieved 2018-06-26. ^ "JELLYFISH KILLS BOY". Daily Mercury (Mackay, Qld. : 1906 - 1954). 1954-03-01. p. 1. Retrieved 2018-06-26. ^ "JELLYFISH KILLED BOY". Barrier Miner (Broken Hill, NSW : 1888 - 1954). 1954-03-02. p. 8. Retrieved 2018-06-26. ^ "YOUTH DIED FROM JELLYFISH STING". Maryborough Chronicle (Qld. : 1947 - 1954). 1954-03-01. p. 3. Retrieved 2018-06-26. ^ "DARWIN BOY DIES". Goulburn Evening Post (NSW : 1940 - 1954). 1954-03-01. p. 6. Retrieved 2018-06-26. ^ "Killed By Jellyfish". West Australian (Perth, WA : 1879 - 1954). 1953-07-22. p. 8. Retrieved 2018-06-26. ^ "JELLYFISH KILLS MAN". Weekly Times (Melbourne, Vic. : 1869 - 1954). 1953-07-22. p. 71. Retrieved 2018-06-26. ^ "JELLY FISH KILLED MAN". Macleay Argus (Kempsey, NSW : 1885 - 1907; 1909 - 1910; 1912 - 1913; 1915 - 1916; 1918 - 1954). 1953-07-27. p. 5. Retrieved 2018-06-26. ^ "MYSTERY STING CAUSES DEATH". Courier-Mail (Brisbane, Qld. : 1933 - 1954). 1953-05-28. p. 1. Retrieved 2018-06-26. ^ "MIGRANT DIES FROM STING BY JELLYFISH". Weekly Times (Melbourne, Vic. : 1869 - 1954). 1950-12-06. p. 4. Retrieved 2018-06-26. ^ "FATAL JELLYFISH WAS SEA WASP". Illawarra Daily Mercury (Wollongong, NSW : 1950 - 1954). 1950-12-05. p. 2. Retrieved 2018-06-26. ^ "FATAL STING BY JELLYFISH". National Advocate (Bathurst, NSW : 1889 - 1954). 1949-12-20. p. 1. Retrieved 2018-06-26. ^ "MONSTER JELLYFISH KILLS BOY". Argus (Melbourne, Vic. : 1848 - 1957). 1949-12-20. p. 5. Retrieved 2018-06-26. ^ "JELLYFISH STINGS BOY TO DEATH". Weekly Times (Melbourne, Vic. : 1869 - 1954). 1949-12-21. p. 6. Retrieved 2018-06-26. ^ a b ""SEA WASP" AS KILLER". Sun (Sydney, NSW : 1910 - 1954). 1945-09-09. p. 6. Retrieved 2018-06-26. ^ "It Was Sea Wasp That Killed N.T. Soldier". Herald (Melbourne, Vic. : 1861 - 1954). 1944-01-22. p. 3. Retrieved 2018-06-26. ^ "JELLYFISH KILLS BOY". Courier-Mail (Brisbane, Qld. : 1933 - 1954). 1941-12-08. p. 3. Retrieved 2018-06-26. ^ "POISONED BY JELLYFISH". News (Adelaide, SA : 1923 - 1954). 1939-12-21. p. 2. Retrieved 2018-06-26. ^ "JELLYFISH STING KILLS BOY". Labor Daily (Sydney, NSW : 1924 - 1938). 1938-03-14. p. 5. Retrieved 2018-06-26. ^ "Stung By Huge Jellyfish, Half-Caste Boy Dies". Advertiser (Adelaide, SA : 1931 - 1954). 1938-03-14. p. 7. Retrieved 2018-06-26. ^ "SWIMMER DIES". Newcastle Morning Herald and Miners' Advocate (NSW : 1876 - 1954). 1938-03-14. p. 9. Retrieved 2018-06-26. ^ "Fatal Jellyfish Sting". Truth (Sydney, NSW : 1894 - 1954). 1938-03-13. p. 19. Retrieved 2018-06-26. ^ "JELLYFISH STING KILLS HALF-CASTE". Daily Telegraph (Sydney, NSW : 1931 - 1954). 1938-03-14. p. 7. Retrieved 2018-06-26. ^ "Boy Killed By Jellyfish". Mail (Adelaide, SA : 1912 - 1954). 1938-03-12. p. 9. Retrieved 2018-06-26. ^ "Bather's Death From Sting Of Jellyfish". Advertiser (Adelaide, SA : 1931 - 1954). 1937-01-22. p. 26. Retrieved 2018-06-26. ^ "STUNG BY JELLYFISH". Northern Standard (Darwin, NT : 1921 - 1955). 1934-12-28. p. 14. Retrieved 2018-06-26. ^ "STUNG BY JELLYFISH". Recorder (Port Pirie, SA : 1919 - 1954). 1934-12-28. p. 1. Retrieved 2018-06-26. ^ "DIED IN AGONY". Weekly Times (Melbourne, Vic. : 1869 - 1954). 1935-01-05. p. 22. Retrieved 2018-06-26. ^ "MAN KILLED BY JELLY FISH". Age (Melbourne, Vic. : 1854 - 1954). 1935-01-10. p. 13. Retrieved 2018-06-26. ^ "STUNG BY JELLYFISH". Age (Melbourne, Vic. : 1854 - 1954). 1930-01-15. p. 10. Retrieved 2018-06-26. ^ "BOY KILLED BY JELLY -FISH". Daily Mercury (Mackay, Qld. : 1906 - 1954). 1916-03-08. p. 8. Retrieved 2018-06-26. ^ "JELLYFISH STINGS". Sun (Sydney, NSW : 1910 - 1954). 1911-05-06. p. 3. Retrieved 2018-06-26. ^ a b "DEADLY JELLY-FISH". Australasian (Melbourne, Vic. : 1864 - 1946). 1911-05-13. p. 39. Retrieved 2018-06-26. ^ "STUNG BY A JELLY-FISH". Sydney Morning Herald (NSW : 1842 - 1954). 1911-05-06. p. 13. Retrieved 2018-06-26. ^ "FATALtTIES FROM JELLYFISH STINGS". Evening Telegraph (Charters Towers, Qld. : 1901 - 1921). 1911-05-12. p. 5. Retrieved 2018-06-26. ^ "DEATH FROM THE STING OF A JELLYFISH". Daily Telegraph (Sydney, NSW : 1883 - 1930). 1892-11-21. p. 5. Retrieved 2018-06-26. ^ "SUDDEN DEATH AT PORT DARWIN". Advertiser (Adelaide, SA : 1889 - 1931). 1892-11-21. p. 5. Retrieved 2018-06-26. ^ Whelan, Mark (2016-07-29). "Experience: I was stung by one of the deadliest creatures on Earth". The Guardian. ISSN 0261-3077. Retrieved 2016-08-01. This page was last edited on 15 January 2019, at 03:29 (UTC).